This is an important week in the Church, leading up to the most important day of the year in the liturgical calendar. In the next couple of days I will discuss a few activities and observances in the home to help your children better understand the Triduum (Holy Thursday, Good Friday, Holy Saturday and Easter Sunday). But some families like to begin the observances with Palm Sunday, and carry them through Monday, Tuesday and Wednesday. It's a great way to build up the anticipation for the big celebration of Easter Sunday. What kind of things can you do to help your family prepare for the Triduum? This website suggests a daily reading with a special snack like homemade pretzels, or by honoring a neighbor or friend with the gift of an Easter lily. This website suggests simple activities like picking a favorite Easter or Christian movie to watch as a family, making Resurrection cookies or ensuring you make it to reconciliation and/or adoration this week. This Greek Orthodox church website shows some beautiful icons appropriate for this week, and includes an explanation of the icons and some prayers. 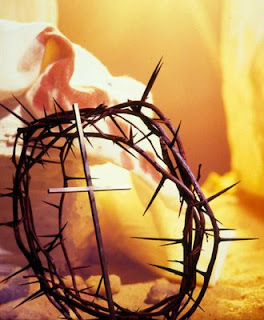 How about making a display of Holy Week items? This could be a fun "treasure hunt" for children. This website has some good ideas on items you could include in your display. (Scan down the page a bit until you come to the "Holy Monday" entry for the list of items. Do you have special activities and observances for these days before Holy Thursday? If so, please share them in the comments section. I would love to hear about them.